"Just wanted to let you know I recieved my package today. It is a beautiful piece. I wanted the best for my dog. I did a lot of research on line and your site caught my eye and I am very happy I purchased from your company. Thank you for the card also. 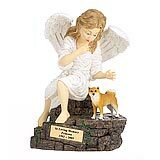 Its very hard losing a pet you have loved for 14 years and losing my mother mother last year of ALS at the age of 67." 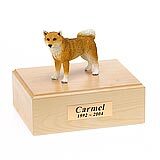 All available Shiba dog urns and memorials will be displayed with the figurine on the Shiba urn you select and in the appropriate size.